Giveashout.com/SimplyEvents.com – What’s On Your Calendar? 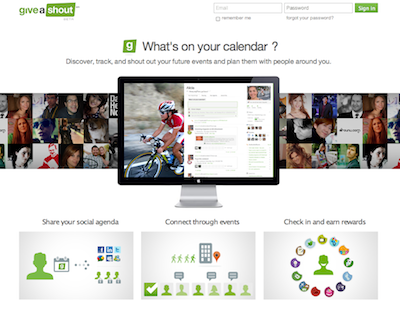 Add your future social activities and events to your Giveashout.com calendar. Mark your next concert at the arena, get-togethers with friends, your child’s next school play, next week’s dentist appointment, a sports competition, TV appearance, sales event, religious service, your next seminar–you name it! Anything you do can be shouted out on your own social agenda. Share it with friends and family privately or across your favorite social network websites (Facebook, Twitter, MSN Live, Google Buzz, Linkedin and MySpace) with a single click. Track your favorite organization’s events or public figure’s calendar and discover all of the cool activities they are sharing; make your next weekend by adding their events to your calendar and continue to connect with people who share your interests. Check in, earn, and collect stickers that can be eventually redeemed for cool coupons and prizes. We want to make it fun and convenient! So, what’s on your calendar? Share not what you are doing but where you are going. All your plans and events in your social calendar. Previous post: WebPlanner.com – Plan and Collaborate. Seamlessly.